My first impression of Jimmer Fredette watching him shoot threes before Sunday’s game against the New York Knicks is he could be in the three-point shooting contest. Fredette easily stroked about 10 straight moving around the arc like they do at the All-Star game contest. My second impression was he talks very fast when he spent about three minutes with reporters declaring his allegiance to his new team. “I hope I can space the floor for these guys and create open shots for my teammates and me,” said Fredette. My third impression, which is usually more than I have in a day, is that Bulls coach Tom Thibodeau will be going slowly in working in Fredette. “He’s coming in late, so we’ll see how it unfolds,” Thibodeau said. “We’re well into the season, so the challenge is to get him up to speed as quickly as we can. You never know how things will unfold. In terms of team defense, that’s usually the biggest adjustment. The fact he can shoot the way he can complements our primary scorers well. He just got here this morning. He hasn’t been through a practice. We’re pleased we picked him up. Then Thibodeau said, “We’ll see how it unfolds” again as he did several times. My fourth impression in working overtime was it’s going to be a slow process and we’re not going to see all that much of Fredette in games for awhile. Though the way things started Sunday with a 37-16 first quarter against the Knicks that could help. But that overall should be no surprise as these players who join teams on buyouts late in seasons generally don’t play too much for awhile. Even the most successful ones like P.J. Brown in Boston when they won their title made their major contributions later in the playoffs and in brief appearances with a key shot or play here or there. That’s what Fredette could do for the Bulls. The Bulls certainly can use shooting and scoring. And Fredette is an excellent shooter. But he’s a small shooting guard. Since Thibodeau focuses and emphasizes defense, you have to pass that test first. And as good as the Bulls are defensively, not everyone is a great defender. So Thibodeau matches his lineups to protect those weaker defenders. It would be difficult for Thibodeau to use Fredette with certain lineups that involve Carlos Boozer, D.J. Augustin and Mike Dunleavy. The player with the least experience is Tony Snell, but given his size and length he tends to be more a help defensively with matchups. And like all coaches, Thibodeau is wary of matchup disadvantages. 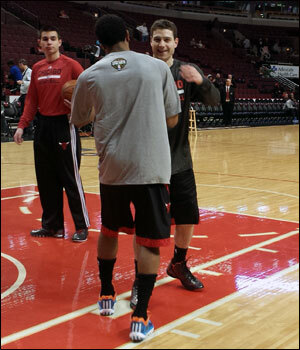 So it will be a learning process as much for the Bulls with Fredette as it will be with Fredette learning his new team. But it’s still potentially an excellent addition since the Bulls get a young player with a needed skill for minimum salary to fill in—Thibodeau did use the word insurance—during emergency and in perhaps some unexpected time. “I hope I can space the floor for these guys and create open shots for my teammates and me,” said Fredette. “Hopefully, I can come in and do what I do on the basketball floor. I just want to get acclimated to the team and the system and help the team on a nightly basis any way I can.